The previous editions of this book were well received by research scholars, teachers and practitioners of Ayurveda and general public. The Keraliya Panchakarma are parts and parcel of Poorvakarmas and they are quoted in original granthas of caraka and Susruta, but they same is practiced in a refined form by the Kerala Vaidyas. The details of the Karmas are with Sanskrit slokas, photos and along with Hindi translation available to readers. Those who are interested may go through this book. The Panchakarma therapy detoxicates the body tissues, cells, and cleanness the system so the drugs consumption for diseases is minimal with maximum benefit. It is beneficial in health, in daily regimen, in seasonal regimen and in diseases. In Kannada this book is the only book, which is available for teachers, students and general public. I am indebted to all the authors and publishers of the books cited in the bibliography. Professor Dr. T.L. 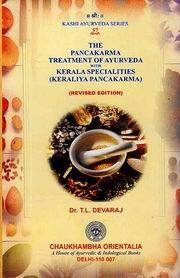 Devaraj is an erudite scholar of Ayurveda. He did MD (Ayurveda) from Banaras Hindu University and M. A. (Hindi) from Mysore University and Sanskrit Sahitya. He is the author of more than 30 books on Ayurveda and his books are translated to Russian, Spain, and Japan. His books are exported 4000 copies to Russia and Spain. His books went into several editions. He worked as a principal and Deputy Director of Ayurveda of Karnataka State. Even after his retirement he is serving the cause of Ayurveda through his publications and free consultation in Baidyanath Ayurveda Bhawan, Bangalore. He was honoured with Award Ayurveda Bhaskar by Sri B. D. Jatti, former Vice President of India, and also honoured by Jagadguru Shankaracharya Sringeri and Jagadguru Shri Balagangadhara Swamiji of Sri Adhichunchanagirimath; Shri Kempa Gowda award, Sri Aryabhata Award, International Service Award, International Man of 2000 are also to his credit.